“I’m trying to lose a few pounds”…I’m sure we’ve all heard this before. Your colleagues, family members, or best friends have uttered these words with great anxiety, concerned about their bulging waistline. Everyone is always in search of that one magical diet that will get them fast results. But out of the thousands of diets available out there, how do you know what really works and what doesn’t? And do any of them promise results in just seven days? The General Motors diet has been around since 1985. It was originally developed by General Motors, along with the Food and Drug Administration and the United States Department of Agriculture, for its employees. It was designed to increase workforce productivity by making the workers healthier. Results of the diet were impressive – a loss of 10 to 17 pounds of weight in just a week! The workers experienced increased efficiency, confidence, and higher energy. The diet was deemed a great success. Probably the biggest reason millions of people swear by the GM diet is because it’s easy to follow. There are no complicated ingredients or great demands on a person’s routine. For this reason, we recommend GM diet for you. Let’s see how this diet works to burn the stored fat. The plan focuses on limiting your weekly diet to eating fruits, vegetables, brown rice, and chicken. The diet focuses on consuming a combination of complex carbohydrates, low-calorie vegetables, and fruits, and increasing water intake to help achieve a weight loss of up to 17 pounds in just seven days. Below is a day-to-day guide for anyone who wants to follow the GM diet. A variety of fruit – apples, oranges, watermelon, kiwi, and papaya are some of your best options. The first day of the diet allows you to eat as many fruits as you like. There are no restrictions on when you can eat. 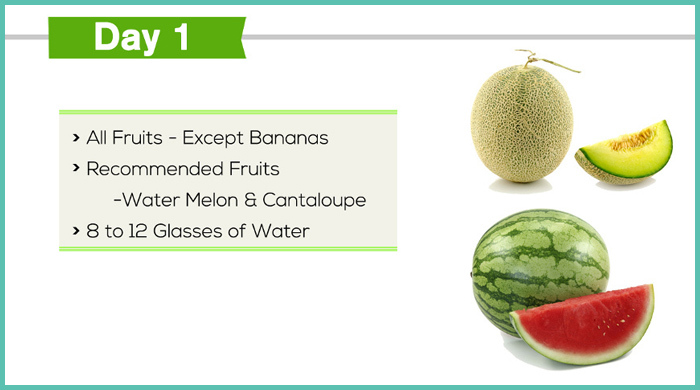 Watermelons and cantaloupes are the recommended fruits as they are high in fiber. Other healthy choices include papaya, apples, and oranges. You must also consume 8 to 12 glasses of water during the day. At no point is it advised to starve. If you feel hungry, you can grab some fruits and satisfy your craving. Fiber-rich fruits keep you full for longer (1). They are also low in fat. In addition, the high amount of water intake will flush out the toxins and prepare your body for the next six days of dieting. There are some foods that may hinder your weight loss. Here is a list of foods that you should avoid. Vegetables – Avoid eating any veggies on this day. Protein – Avoid eating any protein source such as meat, eggs, fish, beans, lentils, and mushrooms. Fats & Oils – Lard, butter, margarine, and safflower oil. Carbs – Avoid all carb rich foods, including brown rice. Dairy – Full fat milk, full fat yogurt, frozen yogurt, ice cream, and cheese. Beverages – Alcohol, soda, sweetened drinks, milkshakes, vegetable juices or smoothies, and packaged fruit juices. Are you allergic or don’t like the taste of certain foods listed in the diet plan? Don’t worry, we have a food substitutes list ready for you. Useful Tip: It is advisable to eat some apples and drink a couple of glasses of water for breakfast. Melons are also a good choice; you can lose up to three pounds by the end of day 1. Eating good and less will help you to a certain extent. To activate the lipid mobilization, you have to exercise. Here is a list of basic exercises that you can start with. Since you will be on only fruits and water, do not perform rigorous exercises. You may do these exercises early in the morning or in the evening after office or school. Here is your customized exercise plan for Day 1. Warning- Please avoid doing any of the exercises listed above if you have any injury. Please consult your trainer or doctor. Day 1 will be comparatively easy since the monotony of eating fruits and veggies has not crept in yet. If you stick to the diet plan and exercise routine, you will feel active, energetic, and great about yourself by the end of Day 1. An assortment of vegetables. Some of the healthiest options would be carrots, beans, tomatoes, cucumbers, lettuce, and cabbage. You have to follow a vegetable-only meal plan on the second day. You can cook the vegetables to make them palatable, or consume them raw. Care should be taken while preparing the vegetables as oil is not allowed. So, forget deep frying your favorite potatoes or eating chips. You can have the vegetables whenever you feel hungry. Flavorings like olive oil or butter can be used sparingly, only if absolutely required. Vegetables have all the nutrients you need to sustain your body. 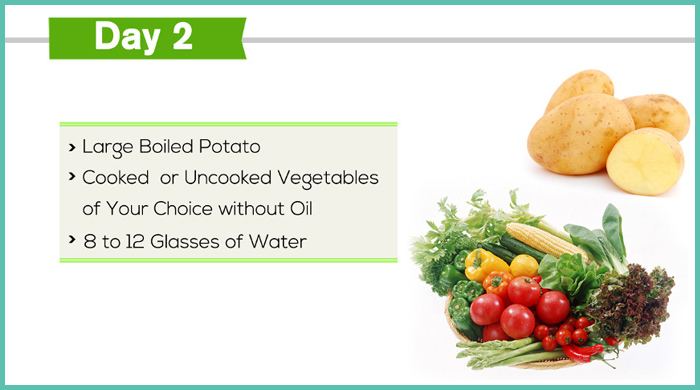 Potatoes have carbohydrates, peas have protein, and carrots and beans are full of fiber and essential vitamins (2). After the relatively low carb day, this will replenish your carb stores and will energize you for the next day of the diet. It’s all good as long as you avoid the following listed foods. 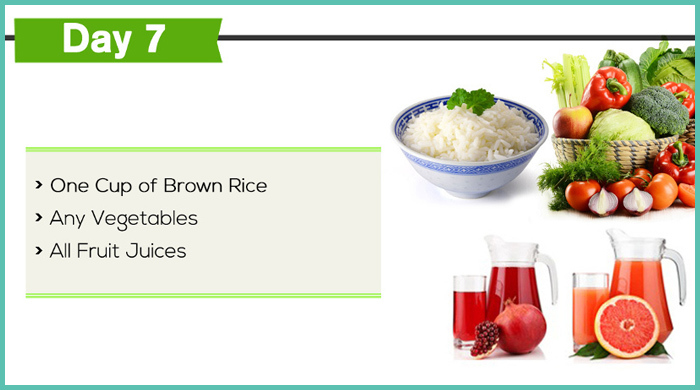 Carbs – Avoid all carb-rich foods, including brown rice. Beverages – Alcohol, soda, sweetened drinks, fresh fruit juices or smoothies, and packaged fruit juices. Bored of eating the same veggies? Take a look at the substitute list to break the monotony. Useful Tip: Eating baked potatoes will help you go through this hard phase! You can also switch to cabbage soup or tomato soup and have it for lunch or dinner. As long as you stay active, you will keep many obesity-related diseases and heart diseases at bay. Check out the exercise regimen for Day 2. A similar exercise routine as Day 1, but a slightly strenuous workout plan to help mobilize the fat. You may do these exercises early in the morning or in the evening after office or school. Surya Namaskar (click here to see the steps to perform Surya Namaskar). Kapalbhati – 50-10 times (take a break if you cannot do it continuously). Baddhakonasana or cobbler pose – 2 sets of 20 reps.
Adho Mukha Shvanasana or downward facing dog pose – 2-3 minutes. Warning – Avoid doing certain yoga asanas or pranayamas if you have an injury. Please consult your doctor or trainer to know the best yoga asanas for you. You may start to feel weak from late afternoon on Day 2. Do not worry, this is normal with most low-calorie diet plans. Your body will not get the usual amounts of carbs and hence will react by making you feel slow and weak. Let’s move on to Day 3 and see what’s in store! A combination of fruits and vegetables. You could stick to the fruits and vegetables consumed during the first two days. The only foods to avoid are potatoes and bananas. On the third day, your body would have almost adjusted to the new diet. After a day of eating just vegetables, fruits will bring a welcome break. It will also combine the benefits of both fruits and vegetables, and provide you with high fiber, nutrient, and protein. 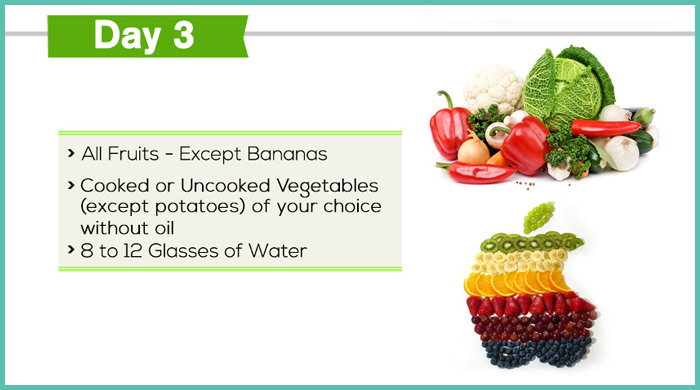 The combination of fruits and vegetables on the third day allows your body to replenish itself. Fruits and vegetables provide fiber and nutrients, giving your body what it needs. The variety will also help satisfy your taste buds and break the monotony of the first two days. The water will help flush the toxins out. Certain foods need to be avoided on Day 3 for better weight loss results. Vegetables – Avoid all veggies on this day. Fruits – Avoid eating bananas. Beverages – Alcohol, soda, sweetened drinks, vegetable smoothies or juices, and packaged fruit juices. If you don’t like a particular food listed in the diet plan, the following food substitute list will definitely help you. Useful Tip: You can include fruits for breakfast and finish it off with fresh vegetables in the evening. You can also drink the GM diet soup for lunch or dinner. A simple and easy to follow exercise regimen will help burn the extra calories. Here is the list of exercises that you should do on Day 3. On this day, start with a warm up and move on to some energy expending exercises. You may do these exercises early in the morning or in the evening after office or school. Here is the list of the exercises that will keep you feeling energetic all day long. Warning – Take care not to injure yourself. If you are not comfortable with doing an exercise continuously, take 2-3 minutes break and then complete the set. Do not perform a particular exercise if you have an old injury. Consult your doctor or trainer to know whether you should do the listed exercises. Day 3 will make you feel better again as you will get a good amount of fruit sugar from the fruits and a little amount of carbs from the veggies. Exercising and staying active will also make you feel great. To keep it real, Day 4 is challenging but that’s the whole point here. Get ready for Day 4. Eight bananas and four glasses of milk. The fruit you’ve been asked to avoid is finally permitted. It is advised to eat eight bananas over the course of the day. Distribute them among your meal and snack times. Also, consume a big glass of milk, thrice, once each at breakfast, lunch, and dinner. If this gets monotonous, you can also include a bowl of soup. Sounds easy, but let’s not leave room for any error. Here is the Day 4 diet schedule. Bananas provide instant energy. They are rich in pectin, which aids digestion. They are also high in potassium and low in salt (3). Milk is a great source of calcium and potassium. It is also fortified with vitamin D that helps strengthen bones (4). Though you will consume mostly bananas and milk, many people make mistakes when it comes to choosing the right additions or even snacking. The following list will help you keep a mental checklist on which foods to avoid on Day 4. Vegetables – Potato and sweet potato. Fruits – Avoid eating all fruits except banana. 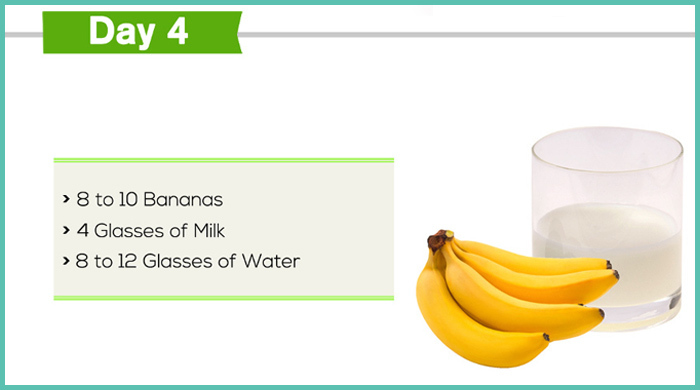 If banana and milk is not your cup of tea, then these substitutes will help you get through Day 4. Useful Tip: You can have your daily ration of bananas in the form of a milkshake and drink it for breakfast or as a mid-morning or evening snack. You could also include the GM diet soup for both lunch and dinner. Bananas provide a lot of energy. Therefore, exercising early in the morning or in the evening will not make you feel weak. The following exercises will help you mobilize fat and boost your metabolism. All those calories from the bananas should be expended so that the energy from the bananas don’t get stored as fat. You may do these exercises early in the morning or in the evening after office or school. Here is the list of exercises that you should do on Day 4. Warning: Do not perform exercises that will worsen an old injury. Take the advice of your doctor or trainer before starting the exercises. The monotony of eating bananas and milk can make you feel demotivated. You may also experience mood swings. However, drinking enough water, working out, and talking to people who have successfully lost weight by following the GM diet will keep you going. Great job! You have successfully completed Day 4. Now, let’s move on to day 5. Vegetarians can opt for a cup of brown rice. Non-vegetarians can have a lean protein source like chicken breast or fish. You will also need to consume six large tomatoes. This day is a feast compared to what you consumed on the first four days. Vegetarians can have a serving of brown rice for lunch. It is recommended that a minimum amount of oil be used while cooking. To combat the high amount of uric acid your body will be producing, you must increase your daily water intake to 15 glasses. For Non-vegetarians: You can include a serving of fish or chicken. Eat 500gms of skinless chicken baked or lightly fried and don’t forget the six tomatoes. An exciting day as you will get to eat a good amount of protein. 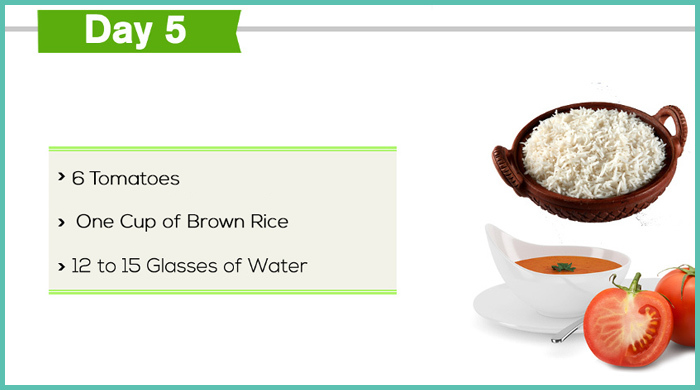 Here is the Day 5 diet plan to make it more easy for you to follow. Brown rice is a complex carbohydrate and is high in fiber (5). It aids digestion. Chicken and fish are excellent sources of lean protein (6). Fish also contains omega-3 oils that are essential for our bodies (7). Tomatoes are high in fiber and aid digestion (8). Useful Tip: Prepare chicken soup with tomatoes in it or roast the pieces without oil in a pan/oven. You can also opt for six eggs divided into three meals + six tomatoes. Don’t forget to drink at least 8 to 10 glasses of water for the day. On Day 5 too you have to be careful about the foods you choose. Here is the list of foods that you should avoid on Day 5. Protein – Beef, pork, and turkey. Carbs – White rice, bread, and processed foods. Beverages – Alcohol, soda, sweetened drinks, and packaged fruit juices. Don’t like to eat what’s on the diet chart? These substitute foods will help you make the best food choice without consuming any extra calories. Exercising is the best way to expend the extra energy. Here is the list of exercises for you to follow on Day 5. Your body need protein for building muscle, energy, and repair. Therefore, do these exercises in the evening after office or school. Here is the list of exercises for Day 5. Kapalbhati – 50-100 times (take a break if you cannot do it continuously). Surya Namaskar (click here to see the steps). Warning – Dieters with an old injury or any heart condition should consult their doctor or trainer before performing these exercises. The protein, carbs, and fruits will uplift your mood and you will feel much better by the end of the day. You will feel more enthusiastic towards working out on Day 5. Two more days to go! I promise you, you will lose a good amount of fat in these last two days. Let’s first have a glimpse of Day 6. Any amount and type of vegetables. Vegetarians can opt for a cup of brown rice. Non-vegetarians can have a lean protein source like chicken breast or fish. This is another relatively high food intake day. Follow a similar pattern today with the addition of vegetables. Vegetables have to be boiled, not fried, and salads shouldn’t have heavy dressings. By day six you should notice visible weight loss. This will give you added motivation to finish the diet on a high. For Non-vegetarians: You can eat up to 500gms of skinless chicken and all vegetables, excluding tomatoes and potatoes. You can eat chicken/eggs or the GM diet soup mid-morning or in the evening. Now let’s take a look at the Day 6 diet plan. In addition to the other nutrient-rich foods, a mix of vegetables provides the fiber and nutrients needed by our body. Useful Tip: Vegetables have to be boiled, not fried, and salads shouldn’t have any heavy dressings. 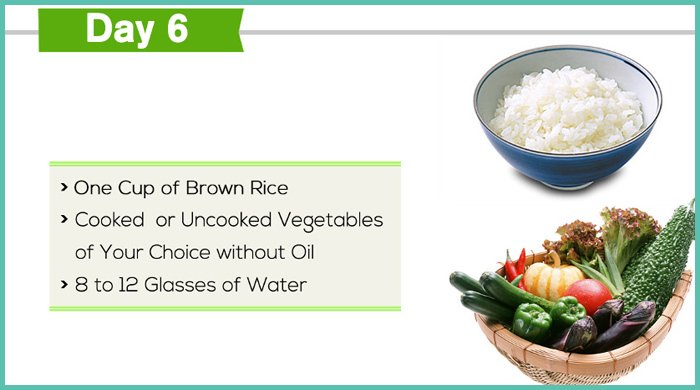 To make sure that nothing goes wrong on Day 6, avoid eating the foods listed below. Fruits – Try to avoid fruits, especially mango, banana, and cherry. It is totally fine if you feel bored eating the same veggies, fruits, proteins, etc. Try these food substitutes to feel encouraged to complete the 7-Day GM diet plan. A little strenuous exercise routine for Day 6 that will help burn the fat and tone the muscles. You may do these exercises early in the morning or in the evening after office or school. Here is the list of exercises for Day 6. Warning: Do not overstrain yourself. Take breaks to catch your breath and keep an electrolyte powder handy to prevent a sudden drop in blood glucose. Refrain from doing exercises that will worsen an old injury or a previously established medical condition. By the end of the Day 6 you will notice a visibly slimmer body and will also feel lighter. Now let’s throw the spotlight on the last day, Day 7 of this diet plan. A cup of brown rice, an assortment of vegetables, and fruit juice. You made it! Today is the final day of the diet. You can have one serving of brown rice and an unlimited quantity of vegetables. To supplement the nutritional value of the vegetables, sugarless fruit juice should be consumed after every meal or snack. Take a look at the detailed diet plan for Day 7. Fruit juices will flush out the toxins from the system, and the other food items will provide you with the much-needed energy. Useful Tip: Include vegetables like cabbage or broccoli to go with the brown rice. Try to include one glass of fruit juice (orange or pineapple) in the morning. As with all other days, Day 7 also requires you to avoid certain foods that will hinder weight loss. Here is the list. Fruits – Banana, cherry, mango, and pear. Protein – Avoid any kind of meat such as beef, turkey, chicken, pork, fish and lentils, beans, soy, and mushrooms. If you are not so happy with the foods in the diet chart, you can opt for these listed substitutes in the next section. Warning: Dieters with a heart condition or any other medical condition should consult their trainer or doctor to know if they should perform the listed exercises. By evening you may feel like eating a high-calorie dessert or munch on potato wafers since you know that you have lost weight. It’s a trap, don’t fall for it. The exercise routine will help you stay active throughout the day. A sense of accomplishment will bring a smile on your face as you go to bed. NOTE- Do not follow GM diet continuously. This will lead to compromised immunity, muscle and bone weakness, and slow down your metabolism. GM diet works best when it is followed every alternate week or once in two weeks. The consumption of fruits in this diet provides the body with fiber that aids digestion and prevents you from feeling hungry fast. Vegetables are packed with essential vitamins and ensure your body receives all the nutrition it needs. Brown rice is a complex carbohydrate that is low in fat. Protein in the form of chicken is low on fat and energy rich. Additionally, protein helps to increase the metabolic rate and burn more fat. The diet doesn’t limit the amount of food you can eat, focusing on limiting what you can and can’t eat. This, along with the frequent small meals and increased water intake, flushes toxins and leads to fat loss. The science explains the success of GM diet but not every scientifically sound diet plans are as popular as GM diet. In the next section you will know exactly why GM diet is a great diet to follow. The cleansing systematic effects of the General Motors diet make it possible to lose a tremendous amount of weight quickly. The best part of the GM Diet plan is that it helps get you into the habit of eating more fresh fruits and vegetables. It will cleanse your system of impurities and give you a sense of well-being — so you’ll feel as good as you look. You actually feel lighter (both physically and emotionally) after just one week. All the foods that are suggested are low in sugar and high in fiber. The increased fiber intake helps digestion. Because of the improved digestion, it helps mobilize fat stores while absorbing nutrition. If it feels like information overload, let’s take you to the next section. This section shows you exactly how to make a delicious GM diet soup. 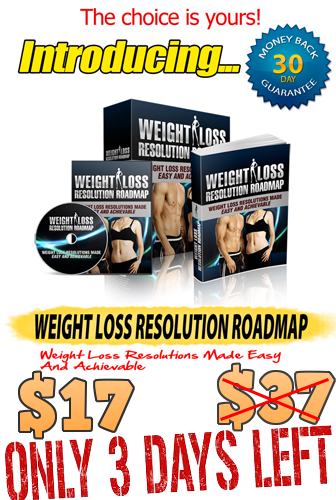 Quick weight loss – The biggest benefit of GM diet is that it helps you lose weight fast! Most people drop between 3 kg to 6 kg in just one week. Detoxification – The diet helps flush out toxins from your system. Because the diet is full of fruits, vegetables, and lots of water, it ensures your system is completely cleansed after day 7. Time Span – Because the diet is just seven days long and ensures fast weight loss, you are more likely to stick to it. However, there are several disadvantages of the GM diet that you should keep in mind before and while following this diet. Take a look. Should You Try The GM Diet? Yes, if you are trying to lose the weight quickly for a special occasion. Being on the GM diet for 7 days will help you drastically lose the fat and make you at least two sizes smaller. If you are determined and prepared for all the mood swings and are able to control the cravings, go for it. BUT if you are looking for a more permanent solution and want to lose weight without resorting to fad diets, try the Mediterranean diet. The lack of scientific support, loss of mass, and metabolic slow down can be harmful in the long run if you follow the GM diet continuously. So, think twice before you take the plunge. Also, make sure to consult your doctor before you start the GM diet. Your weight loss depends on a number of factors like current body weight, medical history, genetics, eating habits, medications, etc. To conclude, the GM diet has worked for many and may work for you too. However, do it only if you have a time crunch and need to lose the weight fast for an upcoming event. Also, do not follow it continuously. If you have any questions, feel free to drop a message in the comments box below. Take care! Riveroaksbeautybar.com is a participant in the Amazon Services LLC Associates Program, an affiliate advertising program designed to provide a means for sites to earn advertising fees by advertising and linking to Amazon.com. 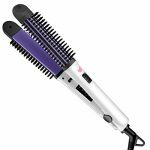 Additionally, Riveroaksbeautybar.com participates in various other affiliate programs, and we sometimes get a commission through purchases made through our links.